It is one of the most famous scorpion species and also one of the largest in the world. The emperor scorpion has a length of 7.9 inches and a weight of 30 grams, which make it one of the most remarkable species visually speaking. It is the biggest species but not the longest. Pregnant females are the ones with the largest weight. They show a dark blue or bright black color with some areas in brown and a gritty texture. The lateral parts of their body have a whitish strip that extends from the head to the tail. The tip of the latter, known as telson, is an intense red color that contrasts with all its anatomy. It is the biggest species but not the longest. After molting, these scorpions exhibit a golden color from the tail to the head that gradually becomes dark until ending in the intense black that we know in adults. The sensory hairs that cover their pincers and tail allow them to discover prey by detecting vibrations in the air and on the ground. The pectins are other sensory organs that also help them to identify the terrain where they walk, being bigger in males. A very odd fact about some scorpions is that they are fluorescent with ultraviolet light. They look a bluish-green color that allows humans and other animals to detect them and take precautions. They are native to West Africa, including Togo, Benin, Burkina Faso, Nigeria, Sierra Leone, Ivory Coast, Ghana, Mali, Ghana, Guinea, and Congo. They live in open savannahs and tropical forests, very close to mounds of termites. They hide in burrows, under the rocks, litter, and debris. Despite being a huge scorpion with a menacing appearance, the truth is that its poison is not lethal to humans. Some molecules that make up their venom are currently under research, as scientists believe that they could have properties against malaria and other harmful bacteria for our health. 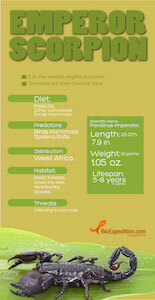 The Pandinus imperator feeds on insects, arthropods, and small invertebrates. Termites are one of their most consumed prey. Sometimes it catches large animals (for their size) like mice and lizards. Nights are their favorite time to go hunting. Young individuals usually kill their prey with the aid of the sting in the tip of their tail, while adults make use of their strong pincers to tear their opponent. Before any mating activity between a male and a female, there must be a previous courtship. The male interlaces the chelicerae of its female partner, and both move from side to side to find a suitable moment and place to complete the process. This moment is very peculiar, as it seems that they execute a dance taken from the pincers. After mating, the mother has a gestation period of 7 months after which 9 to 32 offspring will be born. Scorplings do not look the same as adults; they are born with a color between white and transparent, and with a much smaller length. The first few months the scorplings depend on the mother for food. Their soft body is unable to withstand the attacks of predators. Therefore they remain on the mother’s abdomen (the top of the scorpion) until they are big enough to take care of themselves. When they change their skin, a process known as molt, they get their final color. Emperor scorpions reach sexual maturity at four months old and have a life expectancy of five to eight years. 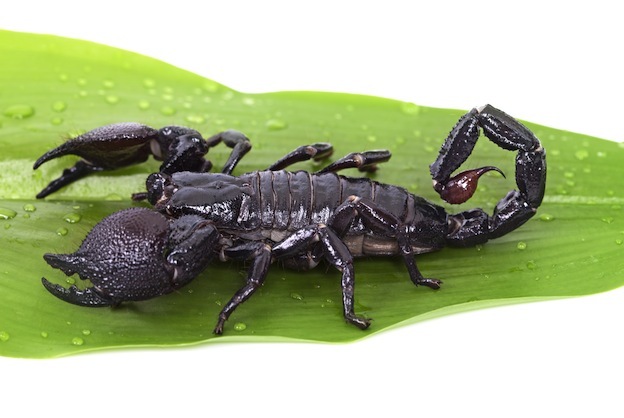 For humans, this type of scorpion represents a demanded pet. Some species of spiders, birds, bats, parasitic wasps, centipedes, lizards and even other scorpions are threats to the emperor scorpions. 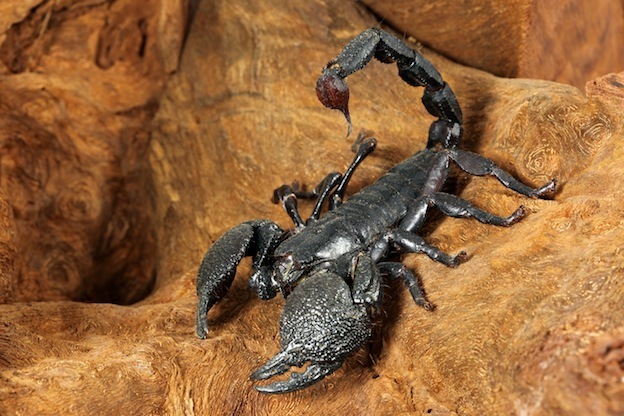 For humans, this type of scorpion represents a demanded pet that is attractive to the people. Traders sell them to those interested in exotic pets who do not hesitate to get. This trade has caught the attention of conservation groups since there is no control and shortly the emperor scorpion could become a threatened arachnid.